Major disasters involving mail or the handling of mail, such as the San Francisco earthquake, Hindenburg crash, the sinking of the Titanic and many others (including the majority of mail plane crashes) are all very well documented (with varying numbers of surviving covers), and many with fairly exotic markings. But what about those hundreds of “lesser disasters” that also affected mail, such as fires, natural disasters, mail truck crashes and train wrecks? In some cases there are very explicit auxiliary markings; in others there are none. But unless there was major loss of human life, it’s frequently difficult to ferret out much information about an incident – and that’s if we’re lucky enough to have some sort of auxiliary marking connected with an event. Such is the case with the postcard illustrated nearby. Although it bears a fairly descriptive three-line handstamp, the only thing we know for sure by reading it is that delivery of the card was delayed by a wreck. Although this postcard, mailed from Kilgore, Neb., is clearly marked “Delayed in Wreck,” very little was known about the mishap until recently. The marking itself reads “Delayed in Wreck PITTS & CHI. Tr. 16 At Chicago Dec. 21'10.” A quick Google search of train wrecks of the time reveals little, as do searches related to destroyed mail or other terms relevant to this type of item. However, by digging a little deeper into contemporaneous editions of local newspapers (and there are several sources), the story begins to emerge, as well as the specific location of the wreck. At about 11:30 p.m. on Dec. 21, 1910, the train engine pulling the “Manhattan Flyer” crashed into a switch engine (a small locomotive usually used in railroad yards) on an elevated Pennsylvania Railroad structure. The switch had apparently been left open by a careless employee. The crash occurred at West 57th Street at Stewart Ave., an unmarked site located just west of today’s Dan Ryan Expressway (I90/I94) within the city limits of Chicago, near Washington Park. The locomotive was thrown off the track, crashing into a viaduct girder below. Although it was originally reported that the boiler exploded, setting fire to the baggage car and the mail coach, it was discovered later the source was a gas tank (for lighting) in one of the cars. When the tank exploded, it immediately ignited nearby mail matter. The fire raged through the mail car and the baggage car, requiring three fire companies to extinguish the blaze. Both cars were completely destroyed, along with all baggage and the vast majority of the mail, including many registered letters containing “cash, diamonds and gems,” which were scooped up in shovels by police and post office employees (while other “bluecoats” stood guard). Many hundreds of other registered letters and Christmas gift parcels were burned beyond salvage (estimated value $250,000). I’ve seen three other postcards from this wreck, but so far no other mail. Interestingly, despite the severity of the crash, none shows evidence of fire. 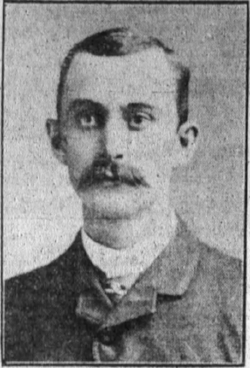 In terms of human loss, there was a single fatality -- engineer J. Harry Westerman -- of Fort Wayne, Ind., who was trapped under the wreckage and scalded by steam. He died the following day. Between a dozen and 20 passengers were injured (some by trampling), but none with life-threatening injuries. J. Harry Westerman, the 53-year-old engineer who was fatally wounded in the crash. Today, the only real evidence we have of what to many at the time was a major event are the scant postal artifacts salvaged from this unusual wreck. Today, the site of the train wreck is nothing more than a nearly deserted raised crossing near Chicago’s Washington Park.